The 2019 Senator Paul Simon Award Competition is now closed. Institutions eligible for consideration for a Simon Award must be accredited, degree-granting higher education institutions of the United States or its territories. An institution awarded a Simon Spotlight Award is eligible to apply for a Simon Award for Comprehensive Internationalization. An institution awarded a Simon Spotlight Award is eligible to apply for a Spotlight Award in a different focus area after five years. 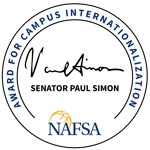 An institution awarded a Simon Award for Comprehensive Internationalization is eligible to apply for a Simon Award, whether Comprehensive or Spotlight, after 10 years. An institution cannot be considered for any Simon Award if it is affiliated with a member of the Simon Selection Committee. Institutions selected to receive a Simon Award will reflect, as much as possible, a variety of institutional types within the Carnegie Classifications, as well as diversity in terms of institutional size, geographic location, and public or private governance. A cover letter on institutional letterhead. A 2,500 word essay that addresses the criteria as described below (Areas of Special Importance for Your Essay) is required for applications for the Comprehensive Award. A 1,800 word essay is required for those applying for the Spotlight Award. If you are applying for both awards, two separate essays must be submitted. Submit the online demographics form. You can draft your submission and save it for your records by downloading the Demographics Form Please also email the Word document to SimonAward[at]nafsa.org as part of your application package. Comprehensive Applications: The cover letter and ten (10) double-sided copies of the essay should be mailed to NAFSA, 1307 New York Avenue, NW, Suite 800, Washington, DC 20005. Applications must be received by NAFSA no later than 12:00 p.m. EST, Friday, November 9, 2018. A Word file or pdf of the cover letter, essay, and demographics form should also be emailed to SimonAward[at]nafsa.org. Send no background material. Institutions selected in the first round of screening will be asked to provide further information on a case-by-case basis. Spotlight Applications: The cover letter, essay, and demographics form should be emailed to SimonAward[at]nafsa.org. Applications must be received by NAFSA no later than 12:00 p.m. EST, Friday, November 9, 2018. How many applications are allowed per institution? Only one application is allowed per institution per award. All applicants are encouraged to read Comprehensive Internationalization: From Concept to Action and Leading Comprehensive Internationalization: Strategy/Tactics before finalizing the application. You will want to engage in a collaborative institutional process. Selection is a two-step process. In the first round, the Simon Selection Committee will review applications for the Comprehensive and Spotlight Awards to identify a group of finalists for each award. Finalists will then receive follow-up questions from the Committee to clarify or expand on items included in the first round submission. When are Simon Award recipients announced? Recipients are announced each spring. Descriptions of the award winners’ activities and achievements are included in an annual publication by NAFSA, now in its fifteenth year, Internationalizing the Campus: Profiles of Success at Colleges and Universities. This report is sent to all 3,500 higher education institutions in the United States. To view past issues, see the Internationalizing the Campus Report . Many recipients order reprints of their profiles for use on campus, with trustees, regents, and with overseas partners. In addition, winners receive their Awards at an annual event in Washington, DC, and are featured in a session at NAFSA’s annual conference. Is feedback available for non-recipient institutions? Non-recipient institutions may request feedback after receiving notification of their award status. All requests should be submitted via e-mail to SimonAward[at]nafsa.org. The Simon Spotlight Award is intended to highlight specific individual programs and services that are judged to be outstanding and/or especially innovative. Applicants who feel they have a specific program, service, etc. in one of the areas noted in the section below that is especially strong, may apply for a Spotlight Award separately from the award for comprehensive internationalization. An institution may apply for both the Spotlight Award and the Comprehensive Award, using separate essays, or apply for just one award. Institutions applying for the Spotlight Award should be able to demonstrate the same attention to intentionality and demonstrable, measurable results that are required of the Comprehensive Award, but limited to one area of achievement. Internationalization is an ongoing process in response to an ever changing global environment and institutional priorities. The Simon Comprehensive Award does not require that institutions reach an “ideal” level of internationalization. Rather, the Simon Comprehensive Award recognizes those institutions making intentional, significant progress to effectively combine elements of the definition above with results of: expanding the reach of internationalization among students, faculty and staff; fostering collaboration across academic, administrative and student service arenas in the interest of internationalization; expanding student, faculty and academic and support units contributing to internationalization; and assessing and measuring that progress. A premium will be placed on innovative and creative approaches. An explanation of how you are measuring progress, and what outcomes have been achieved to date. If you are applying for a Comprehensive Internationalization Award, your essay must address all four major areas. You can use the areas as headers in your statement. If you are applying for a Spotlight Award, your application essay should address one area of achievement that best represents the project or program being highlighted. This area can be used as the focal point in your statement. How does the institutional leadership participate in planning, nurturing, and growing the depth and breadth of internationalization throughout the institution? What is the institution doing to create an ethos that prizes internationalization as a positive good throughout the institution? How are faculty being included; what does their engagement look like? Are all of the institution’s academic units engaged? Are there units which are not included? How are you measuring the impact of your internationalization strategies? What is the institution doing to build and/or support international enrollment management as an integral part of overall enrollment management? Is the international student population growing as planned? How are student support services and co-curricular activities included in internationalization efforts? How is the institution making study abroad accessible for students from all majors and demographics? What is being done to integrate internationalization into the curriculum? How are faculty supported to build global learning into their discipline/field of study? How is an education abroad experience being integrated into the curriculum? What is being done to foster a global perspective among faculty and to reward and recognize faculty? How are global learning efforts assessed and evaluated? How has the institution gone about developing strategic international partnerships and cultivating external relations that contribute to internationalization efforts? If your institution’s mandate includes service to the community, what is being done to include global perspectives within that effort? Again, it is unlikely that any institution will have all of these areas covered completely. Nor will all institutions have the same starting point. Rather, it is expected that all applicants will be stronger in some areas, weaker in others. But, an application for a Comprehensive Internationalization Award that does not include any discussion of one or more of these areas will be less well received by the Simon Selection Committee than one which explains both the institution’s strengths and the areas it recognizes are in need of additional improvement.